“We must devote our time, talent and energy to the next phase of Bermuda’s story: the end of systemic inequality and a new era of social and economic justice leading to a fairer and better Bermuda for all,” Acting Premier and Minister of Public Works Lt/Col David Burch said. Speaking at today’s Labour Day celebrations, Minister Burch said, “Let me first say how truly honoured I am to have this opportunity today to speak on behalf of the Government of Bermuda ….your Government. “As the Minister of Public Works I am proud to work every day alongside men and women who are strong and active members of the Island’s trade unions. Their Union membership makes them better workers, makes us better managers and in the end helps us to provide the services to Bermuda that are so often taken for granted. “This Government is a labour Government and everything we do is with the core ideals of the labour movement in mind. There is dignity in honest work and that work should be properly compensated and that work should be done in conditions of safety and harmony. Our pledge is to never stop working in support of labour. After all, it is who we are and it is what we are. “After 14 months in government we have now taken stock of this community – we have listened and learned from you, the people. Your encouragement and indeed criticism have guided us from Day 1, and I find it inspiring to have ordinary, hard working Bermudians engaged in keeping us accountable for the things we promised and in touch with the changing needs of our society. “The summer break will soon end, school will resume and before we know it, a new legislative session will be upon us. This means that we are about to double our efforts in working for you. The Premier made it clear in his address to Friday night’s banquet that we are determined to tackle the issues that make Bermuda too expensive for most hard working families. “We are done diagnosing the problems; it is time for solving those problems. We were elected to change Bermuda and to make life in this country fairer and better for the people of Bermuda. That starts with deliberately and aggressively bringing down the cost of living. “The implementation of a living wage in this country is important. It is unthinkable in this day and age for an adult, with all the responsibilities demanded of our people, to earn a wage that can never allow them to take care of their primary needs. This will end; and we will introduce a living wage in Bermuda that promotes that dignity in honest work I mentioned earlier. “But a living wage is just one piece of the puzzle. You cannot improve peoples lives if all you do is give them the short term means to exist in an unjust system. The system must be changed; historic systems of inequality must be broken and injustice replaced with justice and equity. “Healthcare; energy; mortgages, taxes…..these features of our everyday lives have become so normal that we have internalized the unjust way in which they are applied to us and we have made the unjust normal. No more family. “Each of these strongholds of economic injustice, sometimes supported by antiquated and unjust laws are set to change. If all we do is give people more money to pay to ‘you know who’ then shame on us. It is time to break the back of these constants in our lives that can be more justly and more equitably applied. “Make no mistake though, the squealing will begin soon, in fact it started last week by utterances from ‘he who served longer than any other’ – as those who have profited from this unjust system start trying to explain how the sky will fall if we don’t keep paying them from our hard earned wages. This is where solidarity and unity of purpose becomes more critical. “We must be united in this fight, because history teaches us that only when we allow ourselves to be divided – can we be defeated. 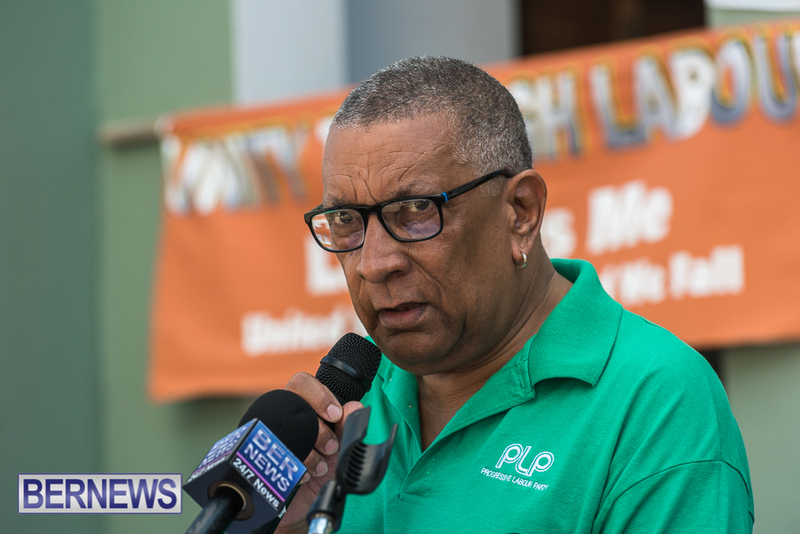 “I’m sure I’m over my time by now – so let me end with this: the Labour movement in 2018 and beyond is the most critical partner in the progress we all want to see for Bermuda. “My hope is that we can achieve agreements on the easy things and capitalize on the natural affinity between a Labour Government and Labour Unions. We must devote our time, talent and energy to the next phase of Bermuda’s story: the end of systemic inequality and a new era of social and economic justice leading to a fairer and better Bermuda for all. Very selective memory by the Minister. “After 14 months in Government bah blah blah”. What about the 14 years, and he was a Minister during part of that time, when nothing was done except for the few at the top, friends and family? Nice try to rewrite history. He is banking on the workers to have poor memories. For 4 years workers did not get a raise (but took furlough days) and BTA was created for a family and friends pay out, seniors were told money dont grow on trees but SpongeBob found over $70 Million for a sailboat race for Billionaires, PLP get in and workers get a raise and seniors get more money. Our memories are hardly poor. Onion juice. Think before you speak the same dribble you do. Well something is wrong maybe economics is not your strong point. Attracting billionaire tourists is never a bad idea by the way. BTA make the ministry look soft and I do not buy your “friends and family” bs. I forgot, that only works for PLP. I know this is going to come as a shock but the last few years of the PLP they froze wages and hiring. Mind you I seem to remember the hiring was because they had run out of government employee numbers. PLP aka a get rich quick scheme. Profitable for the few at the expense of the many. Sounds like America’s Cup to me. The sad fact is that you are one of the many minnows who has signed up to the get rich quick scheme. Good luck. Get used to it . It’s all we’re going to be hearing for the next 4 years seeing the PLP are in continuous election mode. It’ll be ‘Systemic this and that’ ‘Inequalities’ ‘Inequities’ ‘Uneven playing fields’ ‘Disparities left , right and centre’ ‘Historic economic injustices’ and ad nauseum . Keep ‘em angry and they’ll vote for you. Not only get used to it but get over it also. Not to worry , I was over it long before you even began with your poor me , divisive trash talk. I haven’t paid it any mind for decades . LOL But I do feel sorry for you and yours who gobble it up . Dont feel good when you’re on they end of the dip stick does it? What you need to get over is that the AC was Good for Bermuda and Bermudians, just because you didn’t get rich off of it, poor sight. The AC was a quick money scheme that benefitted the undeserved privileged and a Hail Mary for election, but it backfired thats why they took a beating. @Onion Juice ,,,and you get over it when your Government can`t pay wages to workers! Soon come. Many Bermudians lost their jobs because of Col Burch. Its unbelievable to see this guy that cause harm, at the forefront again, It just goes to show you the credibility of the PLP. Does this mean my trash will now get picked up twice a week and the busses will run on schedule and on time? Will the mold stop growing in schools? Will banks stop charging interest on mortgages? Will the people in Tucker’s Town give their properties away to Bermudians? Will politicians stop getting a paycheck? This guy must think the people are stupid!! Could we please start with a universal health care plan for all Bermudians? This may be a useful strategy while increasing minimum wages to create a living wage. You don’t want to increase wages just to pay a private health insurer in a way that only benefits their shareholder and eventually increase the wealth of only you know who. Universal health care in Bermuda will only work if the government slackens immigration policies. At the moment there is a large (and will only get worse) number of elderly, far more than young working people. This means that if there was a universal health care plan there would be more money being taken out (for health care) than going in (taxes). Only way to combat this is well….pathways to status but we know how that went (Smh) and bringing in more young working people from foreign countries to balance out the population. These are facts. Whats wrong with our local young people who spend thousands of dollars to go overseas for education? Nothing. Their point is we have more older than young people in Bermuda. We need to bring in more young people, nothing to do with excluding our youth. Simple economics we need more people paying into the system than taking out (ie:pension, social insurance). Step one, stop paying union dues, and church tithes. The honest hardworking ordinary Bermudian as you put it Burch, is being fleeced. Unions are not required, the law and tribunals protects the employee, and God’s love is free. These giant ornate affluent churches are not needed for God to here you. Systemic Inequality? Yes between the political elite/civil service gravy train and the rest of us who fund them. Burch, come on down and meet a payroll some week, never mind the taxes. Dam it – he’ll be sorting out the buses next. What do the drivers do without a bus to drive?Are they paid? BTA CEO’s get paid $40,000 bonus for non-performance. ….and medical imaging companies get $600,000 of taxpayer funds paid in secret so that their profits stay high. So bus drivers are non performers? How about lowering taxes and reducing Government fees? Great idea. First step is to get rid of you and your cronies. Minister Burch You spoke well & I feel you realize there will be extra debating on the money topics of the Unions & Employers, including Government. How can you help the Union get the $14 from those who are not members in a division but benefit from the agreement between the Union members of the same division & Employer. Take the benefits from them. Making them pay to and to whatever when they don`t want to belong to biu is such BS!!! They don`t want ya benefits! remind me how long the PLP was in power the first time again? this is just pure propaganda. Thats why they got their @$$€$ voted out because they lost focus, but if they stay focused they will remain. I live in the West End and they …. did not pick up our trash on Saturday. Thank you for a)being informed and b) doing the right thing. Shame that it still didn’t go as it was supposed to . Now , as for all these totally brain dead ****ers who were putting their trash out on Sunday and today ,as if we’ve had “day after a public holiday collection” in the last ,hmmm ,let me see , 10 years ? Watch their stupid azzes trash stay out until next Monday . Watch them look the other way if Florence should skirt or slam us and their stinking garbage that was put out ONE WEEK early and abandoned by them gets spread all over the island. And to think that there’s still people who claim that Bermudians are so smart. What? You are not going to look at new problems that may develop? Does that mean the government is going to nationalise my business? Will I then become a civil servant with a pension based on my wage at retirement instead of what I contributed? Methinks Burch is out of control much the same as when he was Home Affairs Minister six years ago and singlehanded pushed the country over the cliff. More b***** again from the PLP. When Legislation is fraftrd & past based upon resentment, fear, hatred and bias eventually there will always be severe negative consequences such as increased unemployment, recessions, population decline, social unrest, economic strife higher Health Care costs, poorer education, more Govt Debt etc.. Where Legislation is drafted and past based upon positive principles for the better good of a whole Society, then it’s very likely that the long term outcome will be very positive for the whole Society with employment up, economic growth, better education, higher longevity, prosperity, lower Govt Debt etc. etc.. It is accepted that things are un fair in Bermuda . The structure of the economy demands that we bring in more workers .The introduction of a living wage haves most foreigners laughing all the way to the bank .If they are getting by on $7. per hr, with food and housing included , than $18.37 will do just fine .It has been shown that of the 3,500 workers at the lower end, the majority are foreigners . Maybe a voucher system would serve the Bermudian worker better .Additionally , the introduction of more retail banks would make a world of difference in Bermuda .A 1% reduction in interest rates would be the greatest benefit to most families . Education can’t be to keep teachers employed if our children are not learning . Fix it, but we won’t . The Unions are just too strong . So you see the problem . Agree with a living wage, but some of these business can barely stay afloat now, so what do you think will happen when they have to increase staff wages. More people will be out of work. Prices will have to increase, to pay for these wages. So, where is the winner in all this? There is never a winner when governments try to control prices. We live in a “free market” economy, not a socialist economy. A free market economy means that prices are what the market will bear. Legislating price controls will limit the products or services available in Bermuda because the cost of providing the product or service does not merit providing it. This is a basic economic theory that our government (like many governments around the world) does not want to know about. What I hear is what can Bermuda do for me, your put there to govern, it should be what can you do for Bermuda. Please get the buses running like they should, BIU, and I will believe that you have all our island’s people’s best interest at heart- no matter the colour of our skins, or political affiliations… The PLP is “our” Govt whether we like it or not- do right by all of Bermuda. Why doesn’t the Minister address the issue of poor work ethic among so many Bermudians. We are sick of seeing government workers in high numbers sitting at job sites with no sense of urgency to get work done! Everything is so laid back. …… the reality is today you can see far too many of us are not willing to pull our butts out of the bed or weed! The blatent two faced PLP makes me want to scream ENOUGH ALREADY PLP !! 7. Someone at long last in Govt. get some b*lls and get the Buses running once and for all on the new schedule. Same with the ferries. Oh, and discover the concept of PLANNED MAINTENANCE for both ferries, tugs, buses and any other PUBLIC TRANSPORT, paid for by US, the public. 8. REDUCE cost of medical care (like not giving over a half millon to certain a certain doctor) by stamping down on abuse of the system, waste, misappropriation, etc. etc. 9. and …..this is just for starters…………PLP are a bunch of muppets who honestly could not organise an p*ss up in a brewery.